You’ve seen the long queues snaking into the practice rooms on the Friday of Halloween weekend. This Topia, a haunted house with an environmental twist, is one of the many student-initiated projects that A&M supports. When I visited the day before Halloween, the practice room corridor had already been remarkably transformed A&M staff shuffled around, maneuvering large panels and boxes in and out one of the practice rooms. In another room, Gabriel Lim ’19 observed as an A&M staff member operated a smoke machine. Within a minute, the whole room was covered in a thin sheet of grey. Envisioning This Topia as an art activism piece, Kei Franklin ’17 conceptualized it with Artslab, an artist collective, and I’dECO, the Yale-NUS sustainability movement. The project’s aim was to promote environmentalism without making it too “in-your-face”, said Lim, an Artslab organizer. To do so, the group borrowed the “haunted house context” to raise awareness of environmental themes. Based on the students’ proposal, the A&M team advised them on equipment and logistics. “They told us what was feasible, given the tools we had,” said Lim. For example, the team acquired leaves and tree branches to furnish one room. With the addition of ultraviolet light strips and the smoke machine I encountered, the room told the story of a ghost girl who had lost her home due to deforestation. 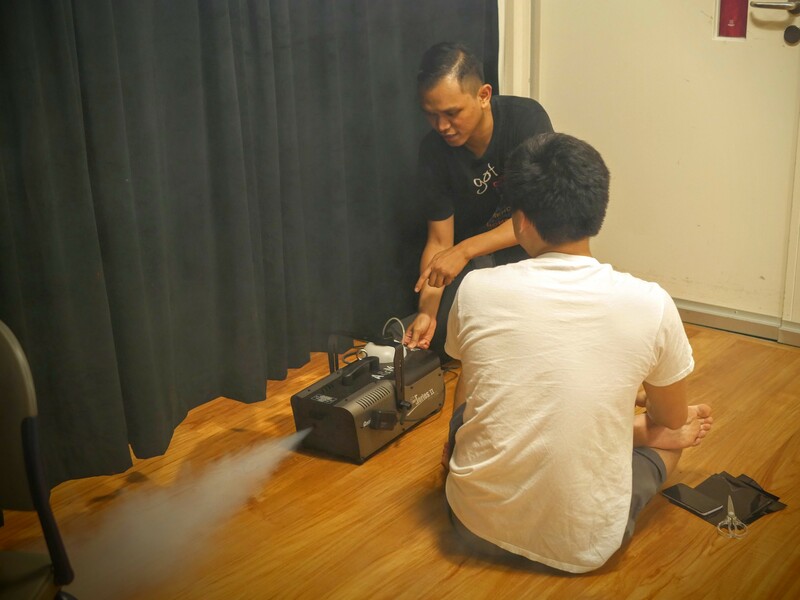 Gabriel Lim ’19 tests out a smoke machine with A&M staff.